Signed on June 8, 2016 by former Governor John Kasich, as of January 2019 Ohio’s legalized medical marijuana law is now operational in Ohio. What does this mean for Ohio’s employers, job applicants and employees? First, there is no Ohio law legalizing marijuana for recreational use. Rather, Ohio has only legalized the medical use of marijuana for a specified number of medical conditions. In addition, Ohio has established certain registration requirements for medical marijuana patients and caregivers. Finally, Ohio allows registered patients to use medical marijuana only in certain ways, and smoking a “joint” is not one of them. Ohio’s medical marijuana law allows patients suffering from one or more of approximately 20 qualifying medical conditions (including HIV/AIDS, epilepsy, cancer, PTSD, etc.) to use medical marijuana. The law only allows medical marijuana to be dispensed to patients or caregivers who are properly registered with the State of Ohio and who possess an Ohio-issued patient or caregiver identification card. Ohio permits registered patients to use medical marijuana via oils, tinctures or extracts, plant material, edibles (food containing THC) and patches.Vaporization of medical marijuana also is permitted but smoking and other combustion of medical marijuana are not allowed. Any retailer who is dispensing medical marijuana must have obtained and paid for a license from the Ohio Board of Pharmacy. 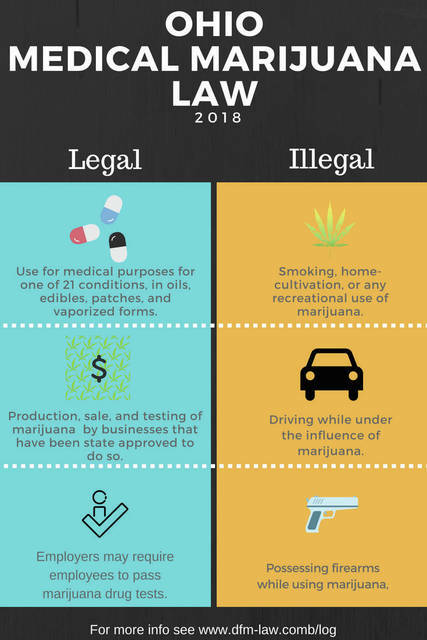 While Ohio and many other states have legalized the possession and use of marijuana for certain medical conditions, marijuana itself remains a “Schedule I” controlled substance under the federal Controlled Substance Act. It also remains illegal for physicians to “prescribe”marijuana. Thus,all Ohioans who use medical marijuana have no protection against the consequences for violating federal criminal law, including possible fines and imprisonment. But since the Obama Administration, our federal government has purposely avoided enforcement of these types of“low level” violations as it has watched the legalized marijuana movement unfold at the state level. Under Ohio’s medical marijuana law, employers need not accommodate a job applicant’s or employee’s use, possession, distribution, being under the influence of or testing positive for medical marijuana. Ohio employers can discharge, discipline, refuse to hire and take any other adverse employment action against an applicant or employee because of the applicant’s or employee’s use, possession, distribution, being under the influence of or testing positive for medical marijuana. Therefore, for Ohio employers who maintain a zero-tolerance policy, medical marijuana users will be faced with a choice of not using medical marijuana or working elsewhere. On the other hand, as Ohio employers begin to see more applicants and employees who are lawfully using medical marijuana, some employers may decide, as a practical business matter, to make an exception for specific off-the-job and off-premises use of medical marijuana. Ohio’s law gives employers that flexibility. This means that Ohio employers must decide whether to make an exception for medical marijuana use or not. For Ohio employers who wish to maintain a zero-tolerance policy, they should consider reviewing the company’s drug-free workplace policy. The policy should clearly state that marijuana is an illegal drug under federal law and that the employer prohibits its applicants and employees from using any form of marijuana for any purpose, including for medical use, even as allowed under Ohio or any state’s law. For Ohio employers who decide to make an exception for lawful and specified use of medical marijuana, these employers, too, need to review and revise their existing policy to include the exception. But there are various legal and practical issues that will still need to be weighed and decided. Therefore, it is recommended that the employer engage an attorney with legal and drafting experience in this developing area of the law. About the Authors: Julia R.Baxter has served as Director of Human Resources for the City of Hilliard since 2017. She previously worked as an associate attorney for Columbus firms Littler Mendelson P.C. and Issac Wiles Burkholder and Teetor, LLC (previously Issac, Brandt, Ledman & Teetor, LLP). Baxter earned her Juris Doctor from The Ohio State University Moritz School of Law in 2010 and her Bachelor’s Degree in criminal justice from The University of Toledo in 2007. Kevin Griffith is an office managing shareholder with Littler Mendelson P.C. where he practices primarily in the areas of business competition litigation and employment litigation. He has defended hundreds of employment discrimination and wrongful termination cases, including several seminal cases before the Ohio Supreme Court, and is a frequent lecturer on employment and labor law. Griffith received his undergraduate degree from the University of Notre Dame and his law degree from Notre Dame Law School. This “Law You Can Use” consumer legal information column was provided by the Ohio State Bar Association (OSBA). Articles appearing in this column are intended to provide broad, general information about the law. This article is not intended to be legal advice. Before applying this information to a specific legal problem, readers are urged to seek advice from a licensed attorney.